It is often forgotten that decades before the World Trade Center existed, the neighborhood was already a thriving commercial center. Restaurants, flower and plant shops, hardware stores, bookstores and numberless other enterprises flourished there, including the old Washington Market on Washington Street. But most of all it was known for the 400-odd radio, TV and hi-fi stores that congregated in the southern half of the area and went by the name of Radio Row. 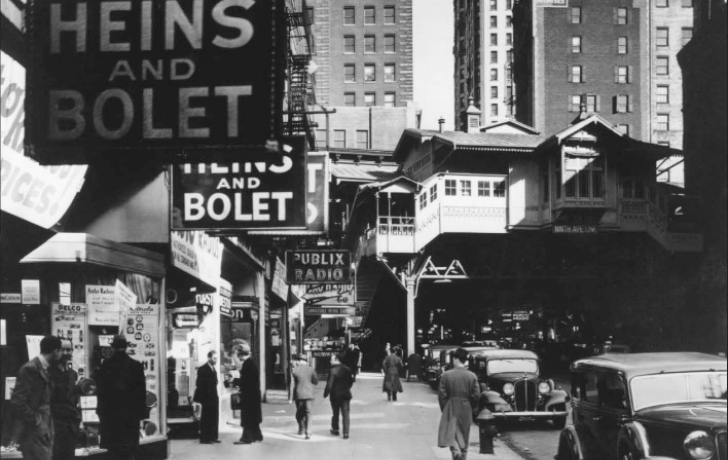 In the 1930s the noted photographer Berenice Abbott captured it in the picture shown above. Her photograph was taken looking east on Cortlandt Street. The elevated railroad station in the middle distance was a stop on the Greenwich Street line (which uptown ran through Tribeca). Beyond it was the Hudson and Manhattan Railroad terminal on Church Street that was eventually razed to make way for the eastern end of the Trade Center. Cortlandt Street was the heart of the district, which was roughly bounded by Dey Street on the north and Liberty Street on the south. It stretched from West Street all the way to Church, and dated back to radio’s earliest days in the 1920s. Abbott’s photograph does not show many shoppers, but the sidewalks were often crowded with ham radio enthusiasts and other devotees who knew the area was the best and often the only place to buy hard-to-find tubes, condensers and other essentials. It was the East Coast center for such things, and customers might come from hundreds of miles away to find the right part. If you could not find what you were looking for in one store you might get it next door or across the street. Although the buildings were largely old and rundown, by the 1950s they comprised a national and international electronics market in which millions of dollars of radio, TV and high fidelity products were sold each year. The stores were uniformly small, mom-and-pop affairs that prided themselves on carrying a large stock of parts and whose employees were happy to give advice. One store, East Radio, was owned by Irving Jaffe, whose ability to establish a rapport with anyone entering the premises was legendary. His wife, Ethel, the store's bookkeeper, remembered one day when she heard Irving talking at great length with a man she couldn’t place. They were conversing like old friends. When the man left after making his purchase, she asked who he was. “Just met him,” came the reply. When the idea of an international trade center downtown was first proposed in the 1950s, Radio Row’s merchants were all for it because it did not appear to threaten them: initial plans called for it to be located along the East River approximately where the South Street Seaport is now. It could only bring more business, they reasoned. And because it was to be built by the Port Authority of New York and New Jersey, which had the power to take ownership of land by eminent domain, it would presumably go up quickly. Then a problem arose. When New Jersey’s Governor Robert Meyner, who shared control of the Port Authority with his New York counterpart, Nelson Rockefeller, was shown the plans in 1962 he asked, in effect, “What’s in it for me?” His state owned the ailing Hudson Tubes, whose downtown line ended blocks to the west, under the aforementioned Hudson and Manhattan terminal on Church Street. How could New Jersey profit from this? So a deal was struck. The WTC would be moved to the west and the Port Authority would take over the Tubes, building a new terminal under the proposed complex. When the Radio Row merchants got the news they screamed bloody murder. The businesses they had labored so hard to build up and which employed thousands of people faced destruction. Their leader, Oscar Nadel, who had sold radio parts and related equipment there since 1920, announced, “We intend to fight. This is a worldwide center for electronics for the home and now they are going to destroy it so that the real estate interests can take over.” Organizing themselves into the Downtown West Businessmens’ Association, the merchants staged a mock funeral along the streets of Radio Row carrying a black-draped coffin on which a sign stated, “Here Lies Mr. Small Businessman. Don’t let the P.A Bury Him.” They also planned legal action. The Port Authority offered to pay a meager $3,000 in moving expenses to each establishment that decided to relocate; otherwise they would pay nothing. A few businesses did move, but most owners simply closed their doors and went out of business. By 1966 most were gone, in anticipation of two tall towers that would later stand in their place for the next three decades. This article first appeared in The Tribeca Trib in October, 2002.